Jeff Bezos started his company by shipping old books out of his garage. But today the founder, chairman, and CEO of Amazon.com is the wealthiest person in the world, with a net worth of approximately $118 billion. Over the course of last year he managed to leapfrog over Bill Gates with his $90 billion. But a more notable feat may be that Bezos has experienced the biggest single-year increase (more than $40 billion) of any individual in the last 100 years. Becoming the first ever centi-billionaire is not easy. You have to be skilled in a lot of areas, primarily in managing other people. Building a mega online retailer such as Amazon requires the help of many individuals and creating a company culture that fosters innovation and long term planning. Recently I was given the opportunity to work at Amazon. I was only employed for about one month and I found the experience positive for the most part. The turnover rate is certainly high. Most new employees who started at the location I worked in did not stay with the company for longer than a year. But for some it can be an exciting and dynamic environment to learn and grow a career. I didn’t get a chance to meet Bezos during my short time at Amazon, but it was clear that his leadership and influence trickled all the way down the corporate ladder. My manager and his manager all have strong work ethics, and have a low tolerance for excuses and incompetency the same way as Jeff Bezos. Amazon is not always the most friendly environment to work in, but because there is no sugar coating the criticism, any feedback is given out efficiently and unambiguously. As a result, changes are implement fast, and workers who don’t pull their own weight are let go from the company. Bezos and my managers are usually right on target when they dismisses bad ideas or give harsh, but accurate and necessary comments. Many employees who work there thrive in this environment. Working at Amazon can certainly be competitive and many people will burn out if they don’t have a certain kind of mindset. But from what I’ve seen and experienced, the work load and expectations are not impossible to manage. The benefits are good, and the pay is fair, at least in the building I was working in. Amazon has created over $200 billion worth of value for its shareholders over the past year. Its current market capitalization is $680 billion. A business cannot be that successful unless the people who operate it are the best workers. Jeff Bezos understands this point and implements polices to help drive competitiveness within the company to make sure Amazon is always ahead of the curve when it comes to innovation and productivity. 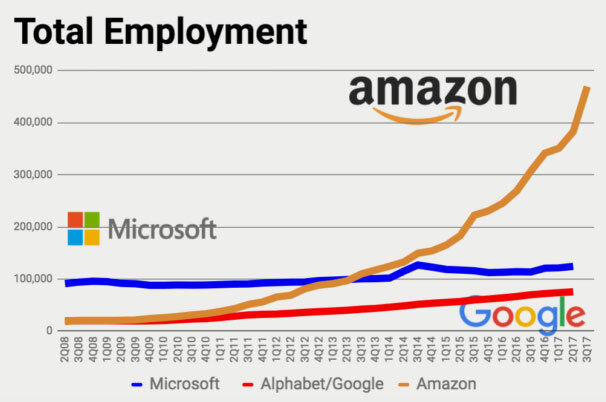 As long as its business model is profitable and works, Amazon will continue to be a fluid but tough environment to work in.